It’s important to keep a cool head in a crisis. At least that’s the theory. 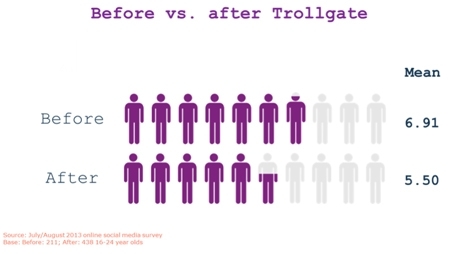 In Twitter’s case, though, their handling of the recent ‘trollgate’ scandal was a little too cool with our data indicating a detrimental impact on the brand. Now that its users send over 500 million tweets a day you would expect Twitter to have a system in place for those occasions when something goes badly wrong. Surprisingly, that didn’t appear to be the case. And by the time Tony Wang, Twitter UK’s general manager, emerged to issue an apology and vow that Twitter would do more to protect its users, the damage had been done. 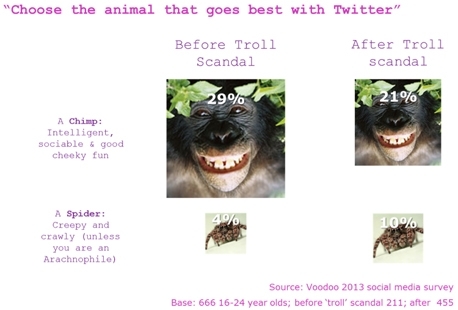 As the scandal broke, Voodoo was in the field with a major online study exploring social media attitudes and behaviour. One key issue we were investigating was trust. Facebook and Google have seen gradual declines in terms of trust and reputation with a slew of negative press headlines over the past couple of years. Until recently, Twitter appeared to have deftly avoided these troubled waters: it wasn’t implicated in the NSA spying scandal and negative reporting tended to focus on individual users rather than the platform itself. But that changed almost overnight: demonstrating once again just how vulnerable companies’ reputations are – and why failing to be seen to act decisively only compounds matters. Our study opened prior to the abuse story breaking and is on-going, which gave us a unique insight into shifting perceptions: responses before show a Twitter trust rating of 6.91 amongst 16-24 year olds. After the story broke, the rating dropped to 5.50. 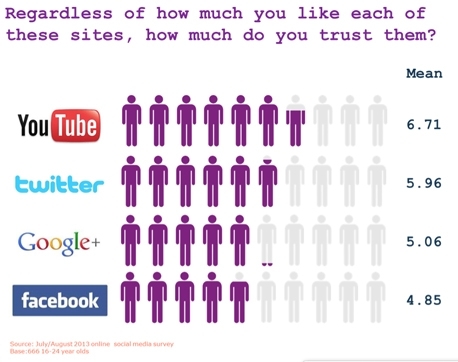 Amongst 25-34s, Twitter’s trust rating fell from 5.25 to 4.88. If ‘trollgate’ had only affected trust then Twitter may have been able to dismiss the episode. After all, there are plenty of brands that we don’t necessarily trust but consume regardless: Facebook is a prominent example. However, our data shows that users’ perceptions of Twitter – ultimately, how they feel about the brand – have also changed. Over time, this could have much more significant consequences. This is something that should cause the brand managers at Twitter some concern. Brand perception is much more complex and less tangible than trust: once negative perceptions of a brand take root, they can be very difficult to shake. 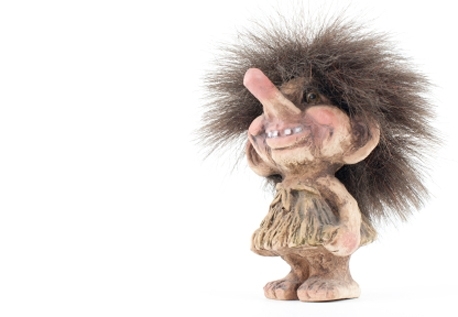 We know that Twitter is against trolls and trolling. Nonetheless, their response to the crisis has been at odds with the imputed and projected nature of the brand. Rather than being bold, open and personal (like a chimp) they have appeared to scuttle around the issue: the classic shadowy corporate rather than the dynamic leader of a brave new digital world. To address these issues, Twitter needs to be seen to be positive and leading the debate around anonymity. Clearly, there is a positive case. As Sinead McSweeney, Twitter’s director of public policy for Europe, said: “Giving people who would not otherwise have a voice [the chance] to be part of discussion, to be part of debates, and maybe to be part of a world that is not generally open to them.” Indeed, enabling the repressed to talk freely – particularly in the Arab world – has enabled the dissemination of news which may otherwise not have found its way into the public domain; contributing significantly to Twitter’s rise in prominence. But, clearly, anonymity is also open to abuse and Twitter needs to decide whether the positives outweigh the negatives. And fast. This is not an area where simple solutions exist. But get this crucial decision right and they will go some way to undoing the damage of the past few weeks. While this change in views on whether people trust Twitter or not is interesting, it remains to be seen as to whether people will actually change their behaviour e.g. stop using it. Saying you're less likely to trust a company isn't the same as it actually affecting your behaviour (which is probably habit-based now in many cases for Twitter users, and we know habits can be hard to break, whatever your intentions). Despite the scandals Facebook has been through, people haven't necessarily stopped using it - and nor have the brands who continue to advertise on there - so while people might temporarily view Twitter differently than they used to, this might not be a long-term shift in views, and it might not ultimately have any impact on actual user behaviour...what we say and what we do are often very different things. Will be interesting to see whether this negativity does have any impact on how people use it. Although I agree with Karen, in the immediate term no the damage will not impact on usability. However, it does lead to longer term susceptibility to being more easily dropped should a strong competitor emerge and/or users start to become bored of the product. These sorts of events are cumulative, you only need to look at what happens every time something goes wrong with a Toyota, the old stats about previous failures pop up. Lack of decisive action now will not have an immediate impact but if it happens again and again it will erode the brand and ultimately the usage. But patent trolls can seriously enhance your value!